The clothespin was invented in 1887 by Solomon P. Moore in Vermont. Though there were many patents of the clothespin following, his simple lever proved to be the best design. However, as time has passed (and particularly in the last 20 years) the American made clothespin has gone from being a lever made with hardwood and a strong steady spring to becoming a pin made of any number of soft woods and flimsy pins. The American made clothespin has almost become extinct due to the influx of cheaply made clothespins that are imported from China. First, We moved to a home with a wonderful clothesline and all I had readily available was the imported pin. I quickly became frustrated with these small, flimsy things. Sure you can get 50 for $5 but they are always breaking and it takes about 10 of them, jammed on the line, to just hold up my small wet rug. Ugh! I didn’t want to spend our money on something that made better fire tender than clothespin. Imported clothespins are cheap in price but also cheap in quality. Anyone who hangs clothes with them knows it. The wood is soft and weak. The springs are wimpy. They don’t hold the clothes on the line dependably and break easily which can be very frustrating and discouraging for the person who loves to dry their items in the sun. Plastic ones are hardly any better. Secondly, The Carpenter’s longs to do what he was passionate about…wood. He LOVES woodworking. We wanted to start a home-based business with a product that was practical and relatively simple to manufacture. We came across the idea of clothespins and fell in love with the idea of creating American made, heavy-duty clothespins that could be handed down through the generations. When we decided to start making our own clothespins I was thrilled! Not only would I be able to line dry my clothes without later finding them in the grass, but It seemed to be a great product to spring board a business with. The Carpenter LOVES wood and LOVES to make beautiful, quality items. He is a hard- working man and always puts in his hundred+ percent, but if he has been working with wood all day that day ends with a look of joy and satisfaction instead of a look of exhaustion. 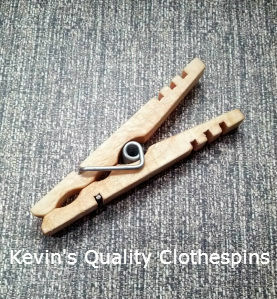 Kevin’s Quality Clothespins are proudly labeled: Made in America!The springs in Kevin’s Quality Clothespins come from an American Manufacturer. Our maple is supplied by a local company. That wood is then handcrafted by The Screwy Carpenter and they are assembled here in the Pacific Northwest. 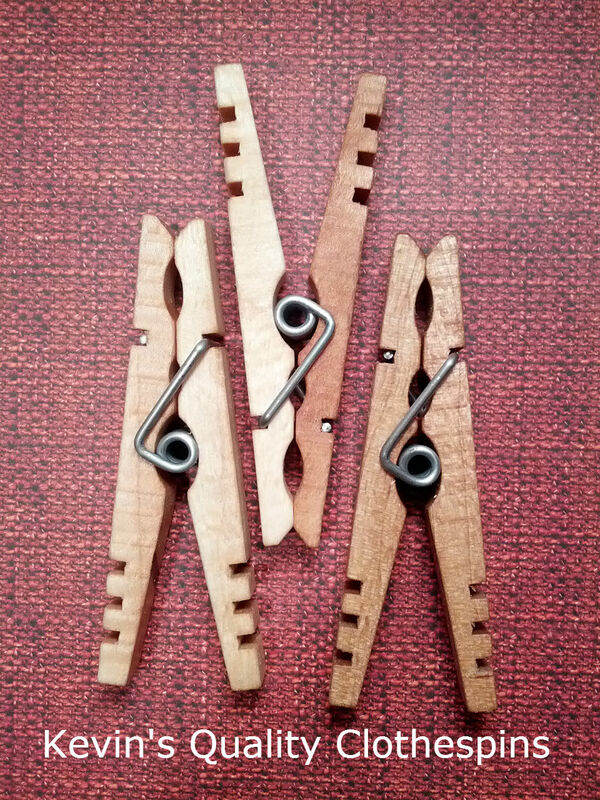 These Classic American style clothespins conform to the traditional style pins first developed by Solomon Moore back in 1887, but also are an improvement over the old clothespins. 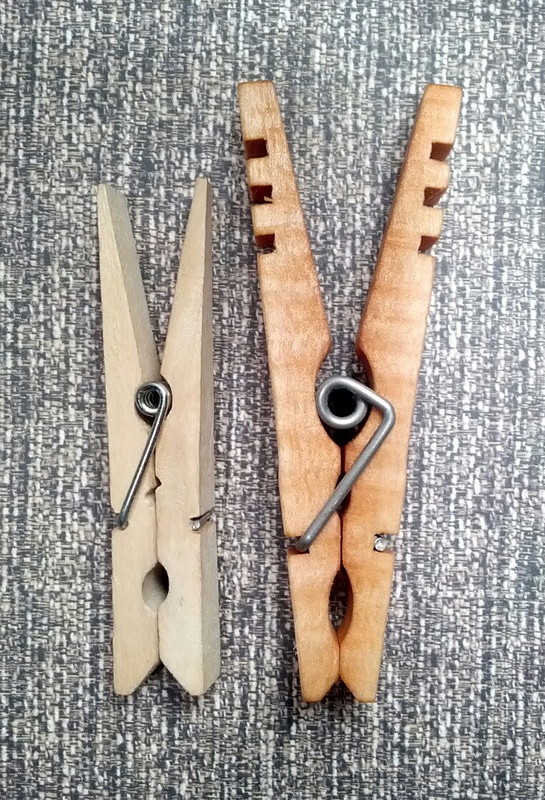 Here is a picture of one of Kevin’s Quality Clothespins next to an imported clothespin. As you can see our clothespins are much more substantial than the imported pin. The total length of the pin is 3-1/2 inches and the wood is cut thicker. The angles of the cuts, the thickness and length come together to make a heavy-duty clothespin. 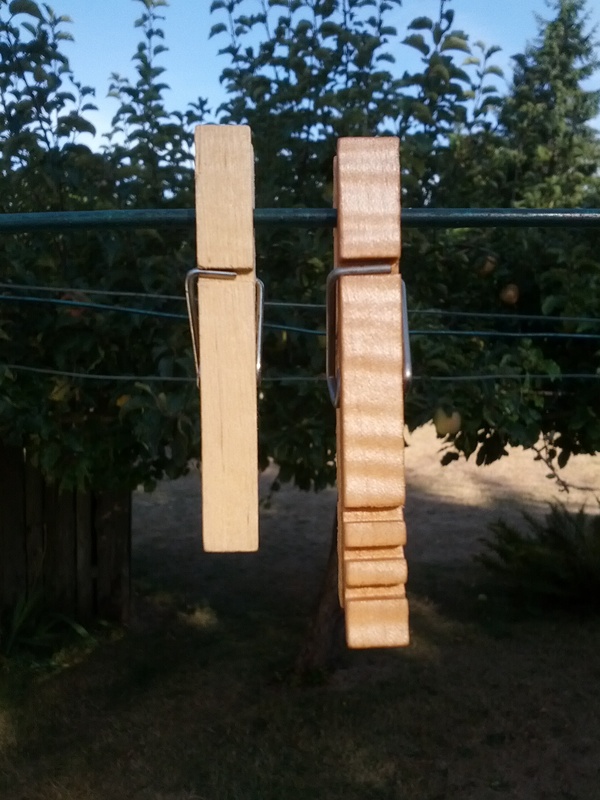 Our clothespins can also be used on a clothes-rod. They open wide and will fit over a 1/2″ dowel. As you can see from the above, Kevin’s Quality Clothespins are not your everyday clothespin. This is a clothespin that will outlast and outperform any of the cheap alternatives available. These heavy duty clothespins are made to be put out on the line, and to be loved for their wonderful practicality. We carefully craft our clothespins in the hope they will be handed down to the next generation. Our clothespins, though wonderful, do not have super powers so please read…Kevin’s Quality Clothespins Disclaimer. You can purchase HERE through our Store and Secure Shopping Cart. Product ships within 1-3 business days. When your order is shipped you will be emailed a tracking number. 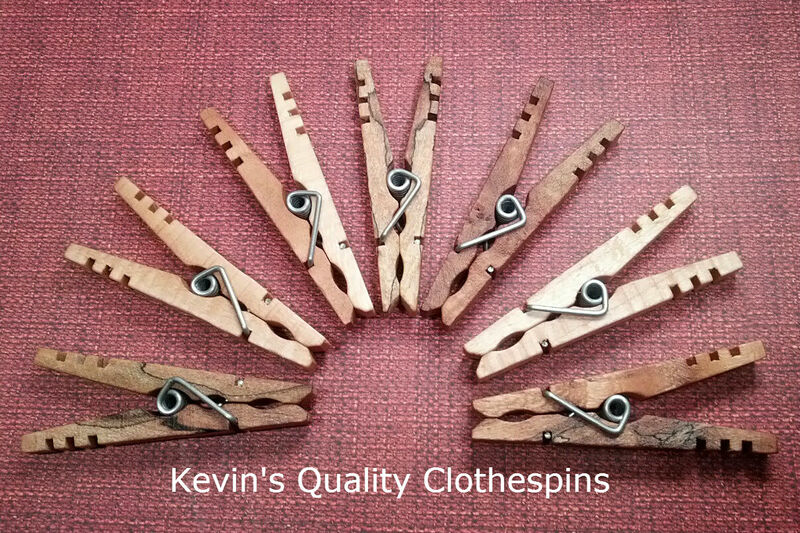 Pingback: Laundry Day with Kevin’s Quality Clothespins!